Supportive policy is essential to help businesses to improve and accelerate logistics emissions accounting, reporting and verification. As part of the LEARN project, a coherent set of policy recommendations was developed for use by national governments in countries worldwide, the European Union (EU) and related organizations involved in setting or implementing policy agenda such as development banks and non-governmental organizations (NGOs). The objective is, through recommending policy priorities, to enable policy making that is aligned with both high-level targets and industry needs and activities. Although policy gaps and recommendations to fill them have a global perspective, a greater emphasis is given to the EU as the European Commission (EC) has explicitly requested these policy recommendations through the LEARN project. It is also noted that the recommendations will need to be tailored to specific countries, which would make them more relevant and effective. Supportive research is important to inform and advance action by industry. 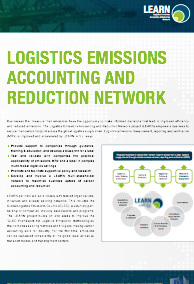 A Research and Development (R&D) Agenda was developed as part of the LEARN project to advance logistics emissions accounting and disclosure, including through the GLEC Declaration that provides companies with a standard template for reporting emissions information to customers and the public. The R&D Agenda can be used by those who fund research, make use of research results, or conduct research in this area: primarily national governments and the European Commission, as well as research institutes, industry, policymakers and civil society. The GLEC Framework and the ISO International Workshop Agreement IWA 16:2015 served as a starting point for this initiative. The R&D Agenda was developed based on findings from a gap analysis, stakeholder workshops, test cases from over 25 companies and training sessions with industry partners that were carried out under the LEARN project. It is emphasized that efforts should involve industry, accompanied by pilots for testing and validation in cooperation with research institutes.